This article is about the American doo wop group. For the French synthpop band, see The Teenagers (French band). 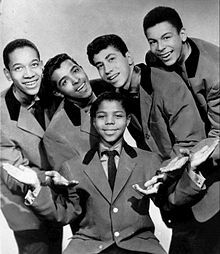 The original five Teenagers; from left to right: Jimmy Merchant, Herman Santiago, Frankie Lymon, Joe Negroni and Sherman Garnes. The Teenagers had their origins in the Earth Angels, a group founded at Edward W. Stitt Junior High School in the Washington Heights section of Manhattan by second tenor Jimmy Merchant and bass Sherman Garnes. Eventually, Garnes and Merchant had added lead singer Herman Santiago and baritone John Seda to their lineup and evolved into The Coupe De Villes. In 1954, 12-year-old Frankie Lymon joined the Coupe De Villes, who changed their name to first the Ermines and later The Premiers. The same year Lymon joined the group, he helped Santiago and Merchant rewrite a song they had composed to create "Why Do Fools Fall In Love". The song got the Teenagers an audition with George Goldner's Gee Records, but Santiago was too sick to sing lead on the day of the audition. Lymon sang the lead on "Why Do Fools Fall in Love" instead, and the group was signed to Gee as The Teenagers, with Lymon as lead singer. "Why Do Fools Fall in Love" was the Teenagers' first and biggest hit. The group, known for both their harmony and choreography, also had hits with "I'm Not a Juvenile Delinquent" and "The ABC's of Love". By 1957, the group was being billed as "Frankie Lymon and the Teenagers". This caused in-fighting, and by September Goldner had pulled Lymon out of the group to record solo. The Teenagers continued recording, bringing in a new lead. Billy Lobrano, as the group's first white member, made them more racially mixed, now with two black, two Hispanic, and one white member. The group had little success with Lobrano, and he left in mid-1958. Sherman Garnes died of a heart attack in 1977, while Joe Negroni died a year later due to a cerebral hemorrhage. Their replacements were Bobby Jay and Frankie's brother Lewis Lymon, respectively. In the 1980s, the Teenagers had resorted to using a female singer to imitate Lymon's prepubescent voice, and Pearl McKinnon joined the band. The members at that time were Jimmy Merchant, Herman Santiago, Eric Ward, and Pearl McKinnon. By 1983, Ward had been replaced by Derek Ventura, and in 1984 Phil Garrito took over for Ventura. Roz Morehead replaced McKinnon, and Marilyn Byers moved into Morehead's lead spot. Later in the 1980s the group had settled on a new lead, Jimmy Castor. Castor remained lead until the 1990s, when he was replaced by Timothy Wilson, former lead of Tiny Tim and the Hits. This line-up appeared on the PBS special Doo Wop 51 in 2000. The group's current line-up is Herman Santiago, Bobby Jay, Terry King and Terrance Farward. They are often billed as Frankie Lymon's Legendary Teenagers or The Legendary Teenagers. "I Want You to Be My Girl" 2 13 3 — "I'm Not a Know It All"
"The ABC's of Love" 77 8 — "Share"
"I'm Not a Juvenile Delinquent" — — 12 "Baby, Baby"
1957 "Teenage Love" — — — "Paper Castles"
"Out in the Cold Again" 1 — 10 — "Miracle in the Rain"
"Everything to Me" — — — "Flip-Flop"
1958 "My Broken Heart" — — — Roulette Records "Mama Wanna Rock"
1960 "Can You Tell Me" — — — End Records "A Little Wiser Now"
1963 "The Lemon-Twist Dance" — — — Tahoe Records "The Twisting Rhumba"
1 Released as by "The Teenagers featuring Frankie Lymon"
2 Early copies released as by "The Teenagers featuring Frankie Lymon"; billing on later pressings changed to "Frankie Lymon & the Teenagers"
Rock, Rock, Rock, 1956, with Chuck Berry, the Moonglows, and the Flamingos. Bennett, Joy (December 1998). The Real Story of "Why Do Fools Fall in Love" - entertainer Frankie Lymon and his widow Emira Lymon. Ebony magazine. Electronic version retrieved from http://www.findarticles.com/p/articles/mi_m1077/is_1998_Dec/ai_53331348/pg_1[permanent dead link] on November 19, 2006. Doo Wop: Frankie Lymon and the Teenagers. The Entertainers We Love. Retrieved from http://tracy_prinze.tripod.com/theentertainerswelove/id32.html on November 19, 2006. Fotentot, Robert. "Profile: Frankie Lymon & the Teenager." About.com. Retrieved from http://oldies.about.com/od/doowo1/p/lymonteenagers.htm?once=true& on November 19, 2006. Goldberg, Marv (2001). "Marv Goldberg's R&B Notebook: The Teenagers". Retrieved from https://web.archive.org/web/20050210191652/http://home.att.net/~marvy42/Teenagers/teenagers.html on November 19, 2006. Grossman, Wendy (September 3, 1998). "Widow of singer claims film phony." Augusta Chronicle. Electronic version retrieved from http://chronicle.augusta.com/stories/090398/fea_124-1369.shtml on November 19, 2006. "I Want You to Be My Girl"
"I Promise to Remember"/"Who Can Explain?" "Out in the Cold Again"